What better way to explore all the exciting towns around New Jersey than with a local mama? Our #NJMOM of the Week, Nisha Vedi Pawar, is taking us on an adventure through Jersey City and spilling the beans on her favorite places to eat, play, and shop in her ‘hood. Just think of it as a real mom’s guide with insider intel you need to know – because mom life gets a lot more groovy when you supplement your usual go-to’s with some new ideas for dining or play dates with the kids, or a fun visit to a new city. Who is NIsha Vedi Pawar? If you’ve ever wanted to learn how to cook an authentic Indian dish, Jersey City mama Nisha Vedi Pawar is the answer to all your tikka dreams. (We often find ourselves stalking Nisha’s Instagram in anticipation of her next mouthwatering recipe!) Nisha is a food editor and freelance recipe developer calling on her Indian heritage to recreate traditional recipes from her childhood – and it’s all artistically wrapped up on her blog, Love Laugh Mirch. 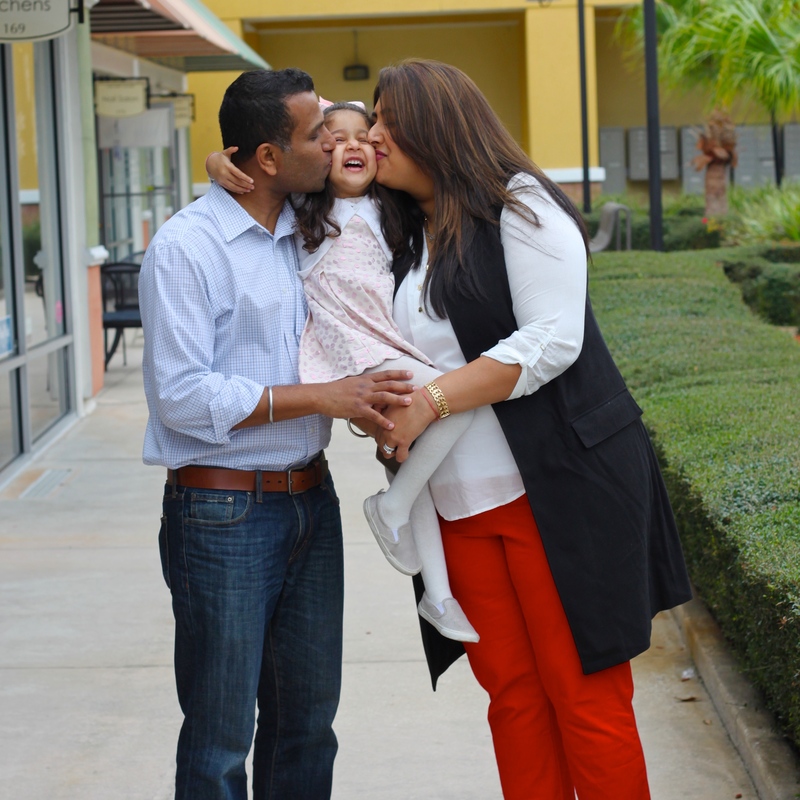 Nisha lives in Jersey City with her husband and daughter. What does she love about JC? The diversity and accessibility that Jersey City offers while maintaining the charm of a small town. The mix of parks, independently owned restaurants and local shops make me fall in love with Jersey City. Read on for Nisha’s favorite places to eat, play, and shop in Jersey City, New Jersey – and a pearl of wisdom on motherhood she’d like to tell other NJMOMs. We love Porta for their pizza and rooftop atmosphere during the warmer months. It’s a short walk from my home and there’s something for everyone in my family on the menu. We love the arugula with truffle oil pizza! Liberty State Park is our favorite place to play in the city. The playgrounds are massive, and we often have picnics there throughout the year. One of my daughter’s favorite things to do is to take the ferry to Ellis Island and say hi to Lady Liberty. Online shopping has become my holy grail after becoming a mom. However, I do love how close we live to Newport Centre. It’s perfect for when I need some shopping therapy – it has a great variety of stores, restaurants and a movie theater. We love all the cultural and kids festivals and programs hosted by local organizations, including Holi in Exchange Place, Dandiya on Newark Avenue, and the All About Downtown Jersey City Street Fair. There’s always something to do in Jersey City and everything is a few blocks away, which makes staying local easy and enjoyable. The most challenging part about motherhood is giving yourself a break and not feeling guilty. It’s easy to get caught up in “mom guilt” (are they eating, sleeping, playing enough?) but there comes a point when you have to stop stressing and enjoy the now, or else you’ll miss out on those everyday moments. For more Jersey City adventures, follow Nisha over on Instagram.